Using the device of bringing Blithe Spirit characters Madame Arcati and the maid Edith to life, Mme Arcati conjures up spirits of Christmas past, as well as Coward’s own creations and songs and other pieces popular during the 1940’s. The spirits invoked bring not only festive fare, but also examine the history of Christmas and are reminiscent of other periods when its celebration was under threat. The result is an eclectic and thought-provoking concoction of songs, prose and verses, many written by Coward himself, but also includes works penned by the 17th century Royalist poet John Taylor, anti-Christmas tract writer Hezekiah Woodward, other wartime writers such as Elizabeth Bowen and American pieces, including the lovely The Boy Who Laughed At Christmas by Ogden Nash. This is very much a grown-ups’ Christmas show, without vulgarity, and has some truly magical moments. Standout items include Coward’s wonderful verse Lie in the Dark and Listen, illustrating his seriousness as a writer and poet, and the Cromwellian section piercingly bringing into stark relief the danger that celebrating Christmas could create. These works, perhaps most especially Ben Johnson’s Masque of Christmas, originally a defiant jab at the Puritans’ condemnation of Christmas and all things ‘popery’, contrast well with Coward’s hilarious digs at the Ministry of Supply in Could You Please Oblige Us With A Bren Gun? and Bednarcyck’s beautiful arrangements of A Nightingale Sang in Berkley Square and London Pride. I particularly loved the 19th century carol Three Kings from Persian Lands Afar by Peter Cornelius, successfully rearranged for three voices, reminding us of Christmas’s true meaning. Also, appropriately given this Centenary year, the diary of World War One soldier Private Frederick Heath is quoted relaying his experience of the Christmas truce. The more sombre sections could all too easily have tipped the balance of the show overall, but Hutchison skilfully avoids this pitfall by placing lighter pieces around them and keeping the surprises coming, successfully celebrating the survival of the festival’s observance. The performances from each cast member are redolent of the period and have just the right mixture of sentimentality, humour and gravity when necessary. The singing is clear, enabling the narrative to move forward, and refreshingly is not overblown. Bednarcyck, as ever, displays superb phrasing and biting wit as Coward, and his rendition of the sardonic Let’s Not Be Beastly to the Germans strikes the listener anew in light of the current debate on Britain’s place in Europe since the War. 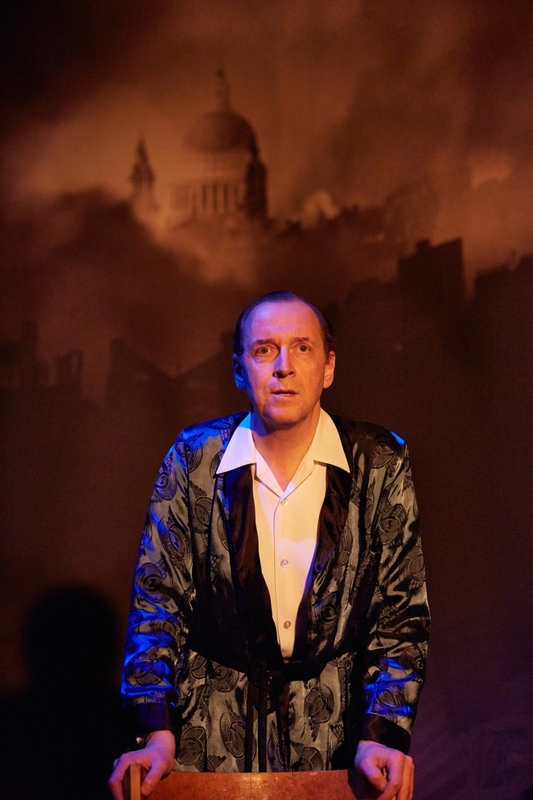 The design and costumes (Annie Gosney) are most effective, using Art Deco furniture, period paper chain decorations, and a backdrop of a photo of the Blitz with St Paul’s looming above the clouds of smoke like a beacon – a famous image oft quoted as a sign of great hope in that bleak time. A delightful piece – guaranteed to put even the most ardent Scrooge into a Christmassy mood, and perhaps timely in the present zeitgeist of political correctness where Christmas observance, or anything too ‘Christian’, could once again be seen as unacceptable. 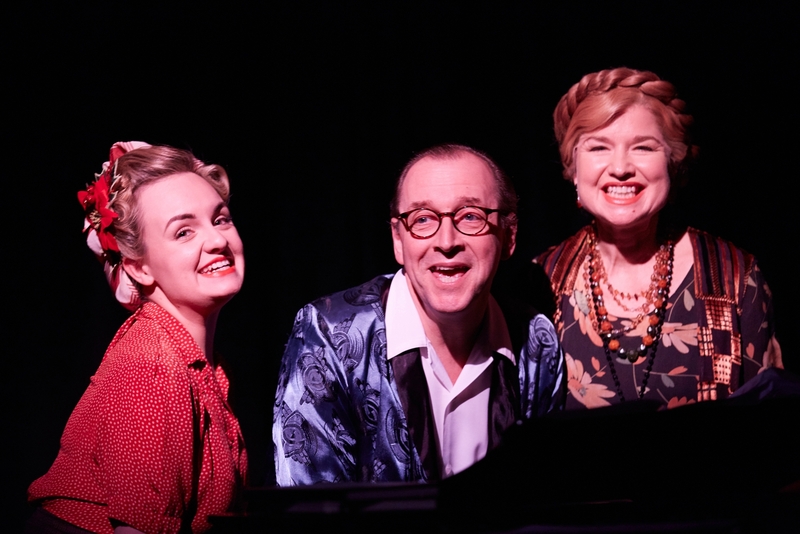 This entry was posted in Theatre Reviews and tagged Annie Gosney, Blithe Spirit, Charlotte Wakefield, fiona jane weston, Issey Van Randwyck, London theatre, Nick Hutchison, Noel Coward, St james Studio, St james Theatre, Stefan Bednarczyk. Bookmark the permalink.